Last May SAP reached yet another milestone; their integrated enterprise resource planning (ERP) solution for small to midsized enterprises surpassed its 60,000th customer. Let’s look at a few of the reasons underlying the success of the leading ERP solution for the midmarket enterprises and large enterprise subsidiaries. No two businesses are exactly alike, and neither are the systems needed to run their business. 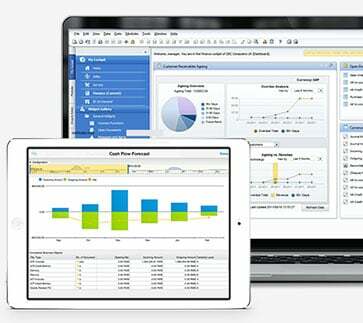 That’s why SAP Business One is designed with flexibility in mind. With its flexible architecture, it can be customise and extended to meet unique and changing needs of the user. Out of the box, SAP Business One offers and affordable way to manage your entire business from accounting and financials, purchasing, inventory, sales and customer relationships, and project management, to operations and human resources. You can start small and add industry-specific functionality using the software development kit or choose from more than 500 certified add-on solutions as your business grows or new challenges arise. 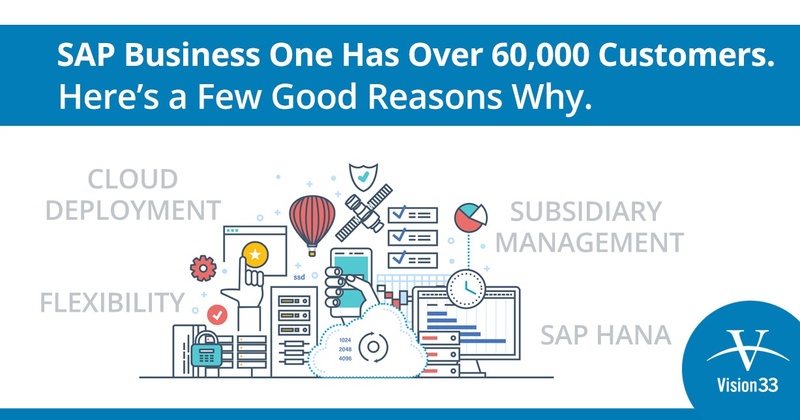 SAP Business One is a scalable ERP solution that grows with your business making it the right choice for small to midsized enterprises. Equally, it's the right solution for large enterprises that want to manage subsidiary operations. SAP Business One enables subsidiaries to be nimble, to fulfill their strategic objective whether it’s to grow the organisation, penetrate a market, reduce costs through global sourcing or manufacturing. That's because SAP Business One works in tandem with other SAP enterprise solutions as part of a two-tier software strategy for large enterprises. Tier-one software like the SAP ERP application runs at your larger operations, while tier-two software such as the SAP Business One application runs at a subsidiary. The two software solutions are then integrated into one coordinated operation, bringing together your processes, applications, and data. At Vision33, more and more we see businesses realising the benefits of the cloud. With SAP Business One Cloud powered by Amazon Web Services (AWS) all a business’ valuable information is safe and secure allowing you to spend more time running your business and less on internal IT costs. With SAP Business One Cloud, all your valuable information is safe and secure allowing you to spend more time running your business and less on internal IT costs. SAP Business One lets you coordinate operations and increase visibility with real-time insight thanks to the power of the SAP HANA platform. This state-of-the-art in-memory computing technology enables you to transform decision making while cost-effectively managing your global IT investment. SAP HANA users get the advantage of a single application that includes all critical business functions – including sales, purchasing, inventory, manufacturing ,and finance – while leveraging the higher performance and speed of SAP HANA. When you couple the transformative power of SAP Business One with a dedicated ERP partner like Vision33, you get a solution that is truly global. Companies that have a global presence must factor in a multitude of local requirements specific to the region of operation. SAP Business One helps you overcome the complexities of a global business model by offering support for 27 languages. It has also been localised for 42 countries to simplify tax calculations, streamline reporting, and optimise legal compliance. Vision33 offers a Global Services team that can enable a business leverage SAP Business One whether you are expanding into a new location, or if you’re expanding into new markets. To learn more about SAP Business One and some of the lesser known features that users should know, watch our video SAP Business One: Top Hidden Features That Every user Must Know.